The past weekend brought a rash of vegetables that just begged to be pickled. 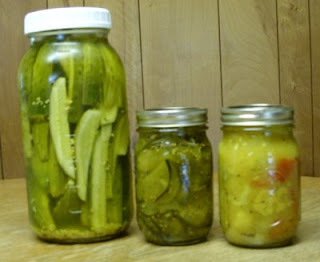 I got a two-quart jar of kosher dills, 13 pints of bread and butter pickles (center) and seven pints of mustard pickles (right). I don't think I have ever done so many pickles in less than a day. But the kosher dills were easy -- just cut the spears, mix up the package of pickle mix (I don't usually take that route, but I love dill spears), bring it to a boil and pour over the spears in the jar. Then they go in the fridge and that's that. The bread and butter ones take about five hours to do and the mustard pickles have to sit overnight in salt before cooking them for an hour or so the next day. And just Wednesday I had another round of picking cukes so I will be pickling more on Thursday.